Matt Fajkus Architecture has created a bright, daylit home in Austin, Texas, and is centered around a huge oak tree on the property. Clad in stucco, the upper level is a floating white box that acts as a “treehouse” for the children’s rooms, while the main floor master suite opens out into an enclosed courtyard, which can be used for social gatherings as well as personal use. An enormous, 2-storey window wall allows natural daylight to pour into the home; its light-colored interiors help to diffuse the light throughout, giving the sense that it’s much larger than it appears. The oak tree that is so integral to the home is easily seen from many angles, and the dappled light created by its leaves create interesting effects, both inside and out. 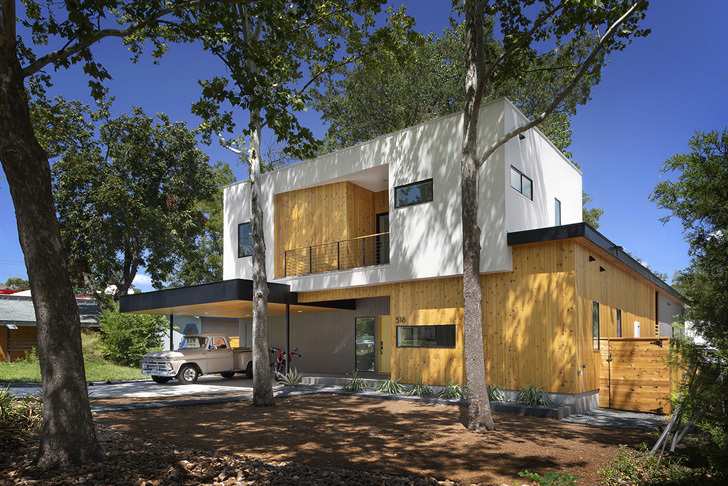 Matt Fajkus Architecture has created a bright, daylit home in Austin, Texas, and is centered around a huge oak tree on the property. Clad in stucco, the upper level is a floating white box that acts as a "treehouse" for the children's rooms, while the main floor master suite opens out into an enclosed courtyard, which can be used for social gatherings as well as personal use. An enormous, 2-storey window wall allows natural daylight to pour into the home; its light-colored interiors help to diffuse the light throughout, giving the sense that it's much larger than it appears. The oak tree that is so integral to the home is easily seen from many angles, and the dappled light created by its leaves create interesting effects, both inside and out.